Saturday, October 2 1908 -- I think that the vignette on the lower right may be a reference to actor William Desmond, who appeared in many films in the 1910s. In 1908 he was, I gather, a local thespian of some note. What the reference to the trip around the world means, I dunno.We will see more on this subject from Herriman. The other vignettes are about boxer Jim Barry's bout against Battling Johnson tonight. Barry will win the fight on a TKO. 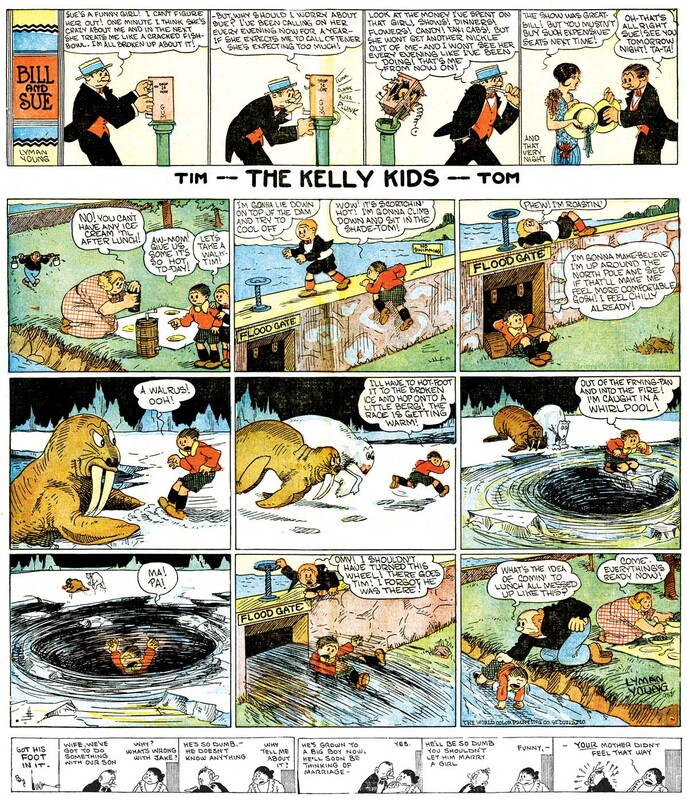 The Kelly Kids was the last major attempt by World Color Printing to keep their foundering Sunday comic section alive after its heydays in the 1900s and early 1910s. After the truly awful Dem Boys was finally put out of its (or is that our) misery, it was replaced by The Kelly Kids on July 13 1918. You'd think after killing one outright Katzenjammer Kids rip-off, the folks at WCP would try going in a different direction. Well, you might think that, but you'd be wrong. The Kelly Kids was yet another Katzenjammer Kids pastiche, this one with the frightfully original angle of having the family be of Irish descent rather than German. At least in the move from Dem Boys to The Kelly Kids readers could be heartened that the new strip was at least competently drawn. The strip was penned by old hand Charles Kahles, who was apparently looking to augment the income he received from his main bread-and-butter strip Hairbreadth Harry, which was being syndicated by rival C-grade syndicate McClure. Kahles never signed The Kelly Kids, but there's no doubt of his distinctively stiff and formal style. Being anonymous on the strip, Kahles evidently saw no great need to put a lot of effort into the proceedings, and about the best you can say for The Kelly Kids during his tenure is that the strip is professionally done, and does the basic job of pulling off standard Katzie-style hijinks. Kahles remained on the strip for five long years, finally jumping ship after the installment of May 20 1923. He was replaced by the great Nate Collier who, sadly, gave WCP as much effort as he was being paid for, which evidently wasn't much. Although Nate occasionally penned a somewhat funny original strip (see above), usually he stuck to the standard prank-pulling silliness expected of him, seldom even bothering to make the pranks stand up to basic logical scrutiny. What's more, Collier's normally crisp penwork was nowhere to be found on this strip, leading me to wonder if he was subbing out the artwork to an assistant. 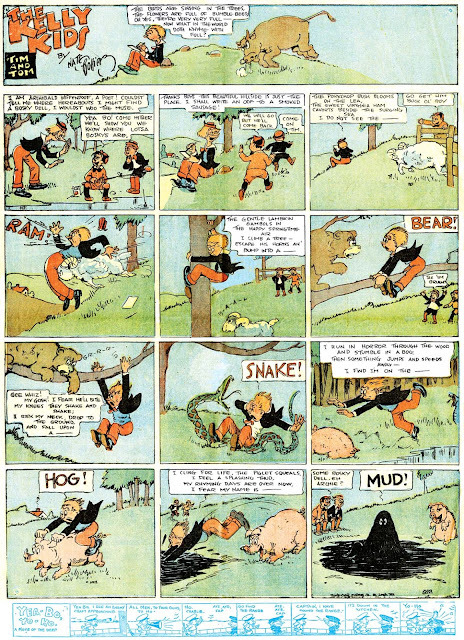 As this was one of the few times that Collier did a newspaper strip, it is doubly sad that he evidently considered it not worth his while to make it attractive and breezily funny, which are otherwise his hallmarks.Collier left after two and a half years, his last strip appearing on September 4 1925. 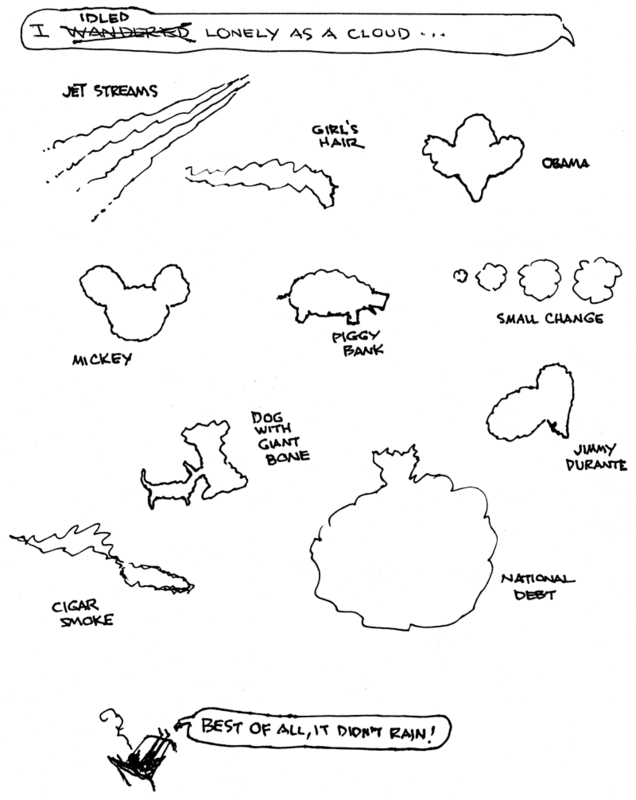 Next to take the helm was Lyman Young, later to create the long-running Tim Tyler's Luck, in his earliest known professional newspaper cartooning job. On The Kelly Kids Lyman exhibited a barely professional grasp of humorous cartooning, which he would apparently later cure as much with the liberal use of art assistants as with improvement of his own skills.Young's run on the strip is marked by the addition of a topper strip called Bill and Sue, the tale of a swain and his sweetie in the same vein as George McManus' topper strip Rosie's Beau. A note about Lyman Young's run on The Kelly Kids. It has been put forth, apparently first by Maurice Horn, and then repeated ad nauseum, that the kids were brother and sister, and that Young's next strip, The Kid Sister, was an offshoot of The Kelly Kids in which the sister was elevated to the starring role. Of course, the Kellys are a pair of brothers, and looking through a stack of Young's Sundays, I find no addition of a sister character. So please folks, let's put that bit of mythology to bed. What I do find (vaguely) interesting about Young's version of The Kelly Kids is that he wasn't too fond of the standard Katzie prank-pulling. 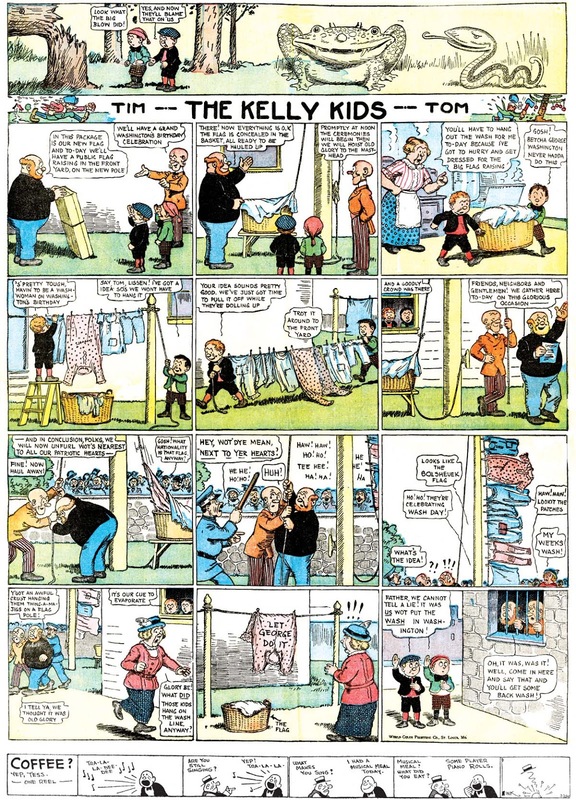 He added a recurring fantasy element (see above for an example) and often elevated the adults to starring roles, sometimes sneaking the kids into the background of just a single panel of their own strip. Lyman Young stuck with the strip for a year and a half, signing off with the episode of March 6 1927. Next up was a fellow who generally only signed himself 'Ring', and whose full name was George Rohlfing. Rohlfing's style was a pretty close approximation of Lyman Young's, in other words not exactly memorable. His contribution to the strip was to add another occasional topper titled Silent Silas, which occasionally ran in place of Bill and Sue. Rohlfing's tenure was brief, ending after just five months on August 7 1927. That date is also the last of the original material Kelly Kids. Although the strip would be a part of the World Color Printing comic section until the bitter end in the late 1930s, from then on it would be a mishmash of reprints from each of the four creators. 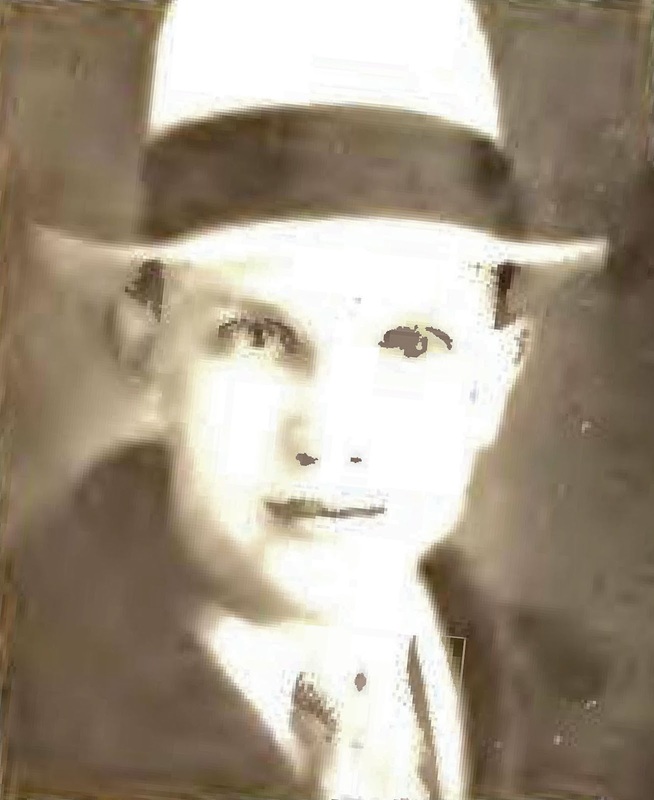 John Miller Baer was born in Blackcreek, Wisconsin, on March 29, 1886. Baer’s full name was on his World War I draft card and his birth information was recorded in the Wisconsin Birth Index at Ancestry.com. In the 1900 U.S. Federal Census, Baer was the son of John and Libbie. His father was a store manager. They resided in Appleton, Wisconsin at 443 State Street. Information about Baer’s art training has not been found. The 1905 Wisconsin state census recorded the return of Baer’s older sister, Addie. 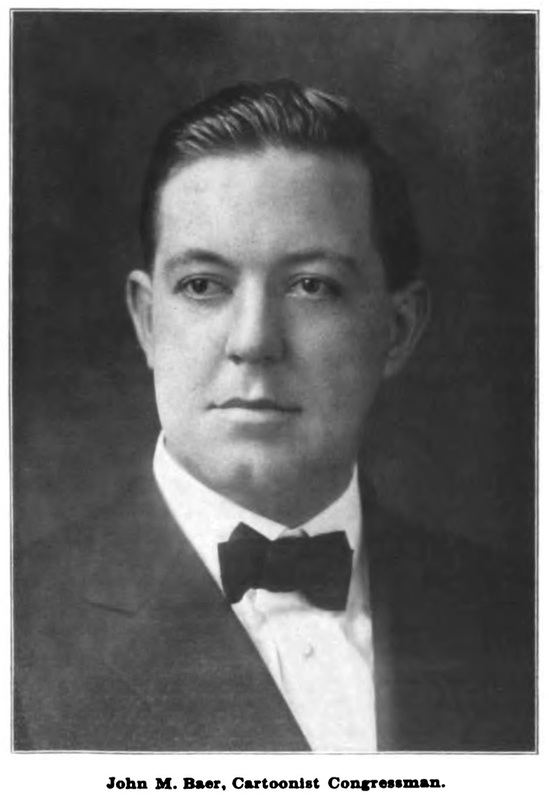 According to the Syracuse University Libraries’ profile of Baer, he graduated “from Lawrence University in Appleton, Wisconsin in 1909,…moved to Beach, North Dakota…[and] worked as a civil engineer, a farmer and postmaster and began submitting cartoons and articles to newspapers.” The Bismarck Daily Tribune (North Dakota), January 17, 1914, published Baer’s drawings of several newsman. Baer has not been found in the 1910 census. The biographical sketch at the Elwyn B. Robinson Department of Special Collections, Chester Fritz Library, University of North Dakota, said Baer married Estella G. Kennedy, on December 28, 1910. Baer, his wife, Della, and son, John, were recorded in the 1915 North Dakota, Territorial and State Census. They lived in Beach. Syracuse University Libraries said he resigned as postmaster in 1916, relocated to Fargo and was the Courier-News cartoonist. Baer entered the race for a Congressional seat in the House of Representatives. An advertisement ran in the Wahpeton Times (North Dakota) July 5, 1917. Baer’s victory was reported in many newspapers including the Bismarck Tribune, July 11, 1917; the Ogden Standard (North Dakota), August 16, 1917; and the Broad Ax (Salt Lake City, Utah) September 8, 1917. Congressman Baer continued to produce cartoons and drawings. Some appeared in the Tacoma Times (Washington), September 1, 1917. The Inland Printer, December 1917, and Cartoons Magazine, February 1918, reported Baer’s political career. Around 1918, Congressman Baer signed his World War I draft card. He was a Fargo, North Dakota resident. The description on the card said he was tall and stout with brown eyes and black hair. In 1918 Baer began his reelection campaign with advertising in newspapers such as the Wahpeton Times (Washington), October 17, 1918. According to the 1920 census, Congressman Baer remained in Fargo with his wife and three sons. The New York Times, July 3, 1920, said Baer lost his re-election bid. Baer continued cartooning and moved to Washington, D.C. The 1929 city directory listed Baer at 630 Allison N.W. and cartoonist at the Labor Co-operative Educational and Publishing Society. In the 1930 and 1940 censuses, Baer’s Washington, D.C. address was 1617 Buchanan N.W. He was a newspaper cartoonist. The 1958 Silver Spring, Maryland city directory listed Baer at 3809 East West Highway. He was a commercial artist at the Labor Co-operative Educational and Publishing Society. The 1960 directory had the same address for Baer who was a cartoonist at the Union Label Trades & Labor Newspaper. A family tree at Ancestry.com said Baer passed away February 18, 1970, in Washington, D.C. He was buried at Gate of Heaven Cemetery. James Blakely Trapp was born in Oklahoma on August 15, 1905, according to the California Death Index at Ancestry.com. Trapp has not yet been found in the 1910 and 1920 U.S. Federal Censuses. Little is known about the first two decades of his life and education. 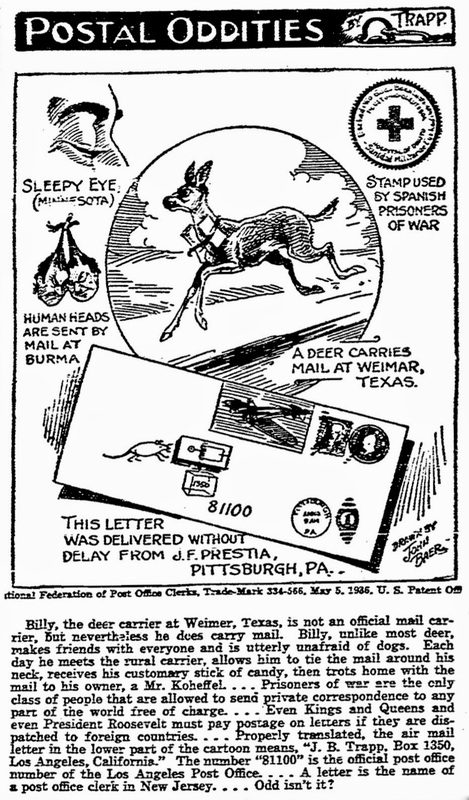 …Trapp enlisted the services of a friend, Ed McGlynn*, as cartoonist, and sent a sample installment of the Oddities, in cartoon form, to Gilbert E. Hyatt, editor of the Union Postal Clerk, which is the official monthly magazine published by the National Federation of Post Office Clerks. Hyatt published it at once, and asked for more. The Journal of Electrical Workers and Operators, January 1936, explained how the cartoon spawned the radio version. 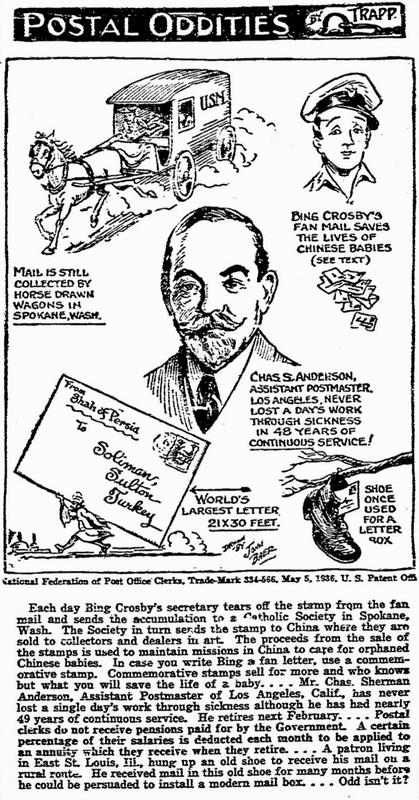 The other publicity feature of the Post Office Clerks’ Federation is a series of radio broadcasts under the title of “Post Oddities by Trapp.” This sets forth, in the fashion of Ripley’s “Believe It or Not,” curious facts concerning the postal service. 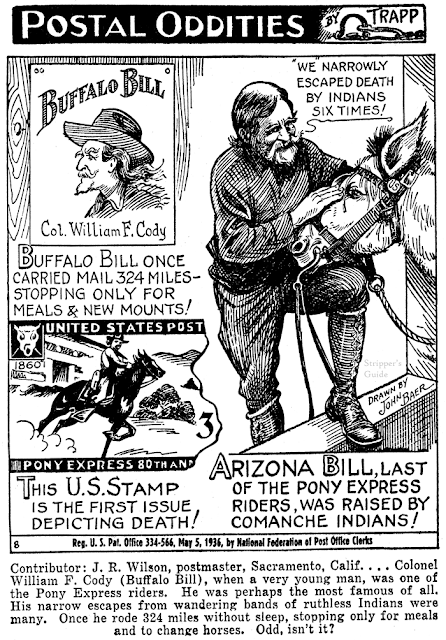 Starting as a cartoon feature in the Union Postal Clerk, official magazine of the National Federation of Post Office Clerks, it was picked up by a radio station in Wichita, Kansas, as a feature. It made such a hit that its author, J. B. Trapp, a post office clerk in the Wichita office, and a member of the clerks’ federation, has been offered numerous other engagements. The Richmond Times-Dispatch (Virginia), February 21, 1936, announced the upcoming radio broadcast of Postal Oddities and said the idea began with the strip by “Cartoonist Trapp.” Other newspapers referred to Trapp as the author. Genesee County Express and Advertiser (Dansville, New York), March 26, 1936, reported the coming of Trapp’s radio program. Rochester Local No. 215, National Federation of Post Office Clerks, is sponsoring a broadcast through station WHAM of Rochester, which is entitled “Postal Oddities.” Every Saturday morning, from 8:15 to 8:45 o’clock Trapp will tell many stories and experiences in the postal service of interest to all users of Uncle Sam’s big communication business. 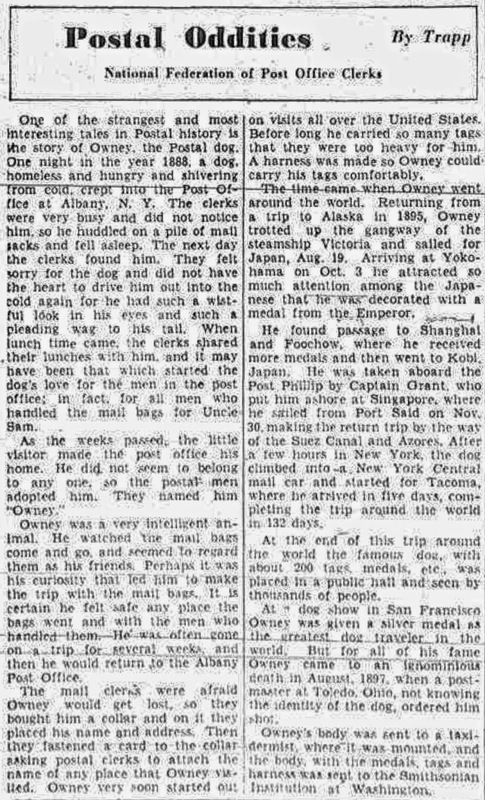 In 1937 the Brooklyn Daily Eagle (New York) carried Trapp’s column Postal Oddities. 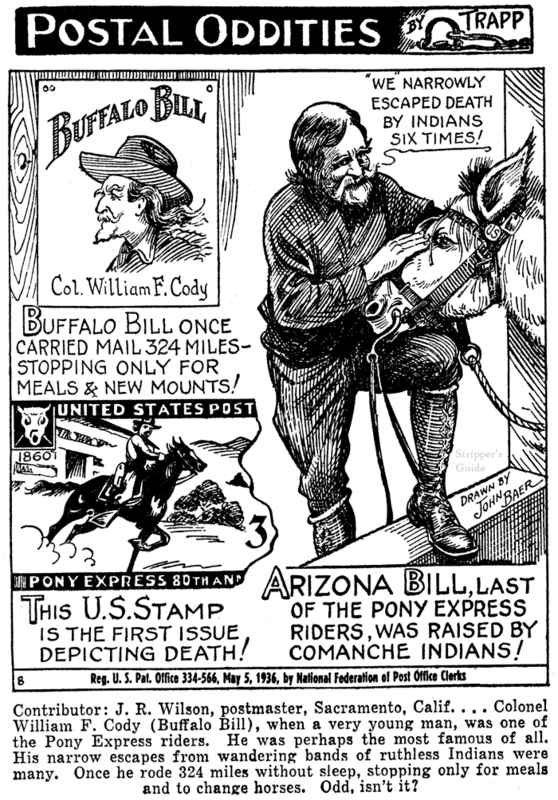 American Newspaper Comics (2012) said Postal Oddites began appearing in newspapers in the late 1930s. 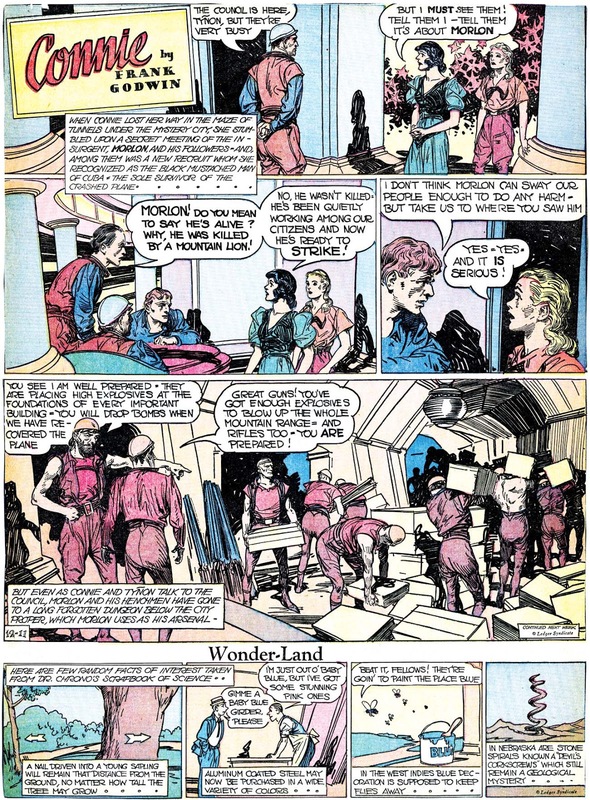 The panel was drawn by John M. Baer. 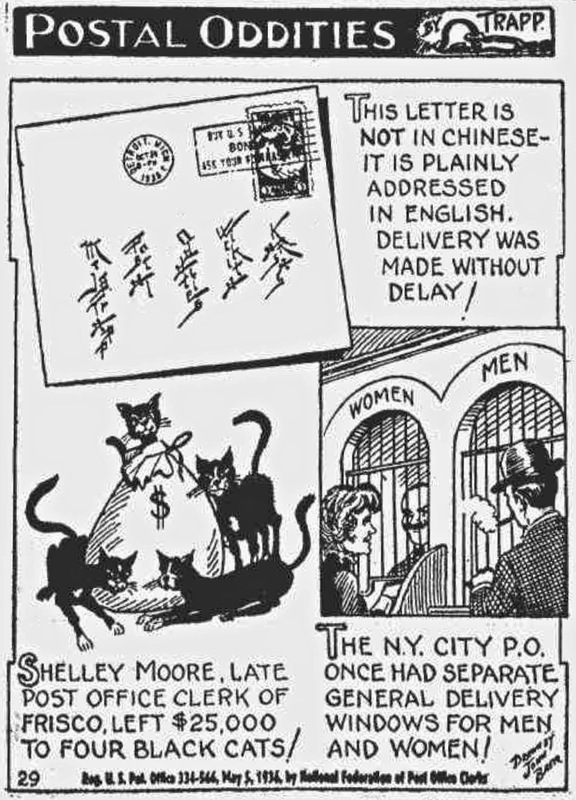 A collection of Postal Oddities cartoons were published in a book by National Federation of Post Office Clerks in the mid-1940s. The panel continued into the 1940s. In the 1940 census, Trapp resided in Los Angeles, California, at 3619 West 59th Street. He had an eighth grade education and worked in the information department of the U.S. Post Office. His wife was named Bertha and daughter, Charlotte. Trapp served in the military but the record at Ancestry.com did not identify the branch. Trapp passed away October 5, 1979, in Oakland, California, according to the California and Social Security Death Indexes. * Edward Patrick McGlynn was born in Cheltenham, Missouri, on January 29, 1889, according to his World War I draft card. In the 1930 and 1940 U.S. Federal Censuses, his occupation was post office clerk. Evidently he was an amateur cartoonist when Postal Oddities appeared in the Union Postal Clerk. McGlynn passed away July 19, 1973 in Wichita, Kansas. I've lately heard vague rumblings from Tom Heintjes that lead me to believe that Hogan's Alley #20 is to be published soon. And soon, on the Hogans' Alley schedule, should mean sometime before the next presidential election. Well, good things come to those who wait. And wait. And wait. When issue #20 of that fantabulous magazine is published, you'll be regaled by, among other lesser material, my article about the many imitators of Robert Ripley's Believe It or Not. My favorite Ripley imitators are the advertising and public service rip-offs, and you'll get a heapin' helpin' of those for sure. And here's one to wet your whistle. Postal Oddities was a Believe It or Not imitator whose subject was limited to post office-related matters. Why would a newspaper run a feature of such limited interest, you ask? The answer is simple. It was offered free to newspapers by the National Federation of Post Office Clerks. Tougher question is why the N.F.O.P.O.C. (whew!) felt the need to produce and distribute it. The fact is that many organizations considered it good public relations to produce features like this, and they're not at all uncommon to find in newspapers, mostly of the 1930s to 1950s. These freebies were a real boon to small weekly and rural papers, which used these things to flesh out their issues and provide some much needed graphic interest. Postal Oddities took a strange circuitous route to the newspaper. It began in a post office clerk trade publication, and was then picked up, believe it or not, as a surprisingly popular radio show. After that, the panel was revived and offered to newspapers from 1937 to about 1945 (freebies like these are nearly impossible to assign definitive start and end dates, as they could sit in an editor's slush pile for years). The panels were copyrighted 1936 throughout, but that copyright seems to refer to the year the radio show was airing, because I have never seen a sample of this feature appearing in papers earlier than 1937. Earlier panels have a long text piece (see top two samples), but later the text content was slashed way back (bottom sample). The panels were also numbered, though most papers routed that out, and my impression is that the numbering doesn't really mean much anyway. Postal Oddities was produced by writer Trapp (gotta love the graphic by his credit) and cartoonist John Baer. I'll leave their interesting stories to the capable hands of Alex Jay, whose Ink-Slinger Profiles of them will appear in coming days. I've read that Ripley made up a lot of his items...wonder if the honorable postal clerks did, too? For many years, Baer drew a tepid editorial cartoon for a bland monthly union newspaper called Labor. It was anything but a radical paper, at least not in the sixties when I remember it. It was aimed at a family readership, and Baer's creaky style was the object of derision. Elsewhere a column of jokes, the stock of which hadn't been replenished in decades, had gags featuring ice men and "speed Cops" catching "scorchers" going forty miles an hour. You'd get it free if you belonged to the union, and worth every cent.